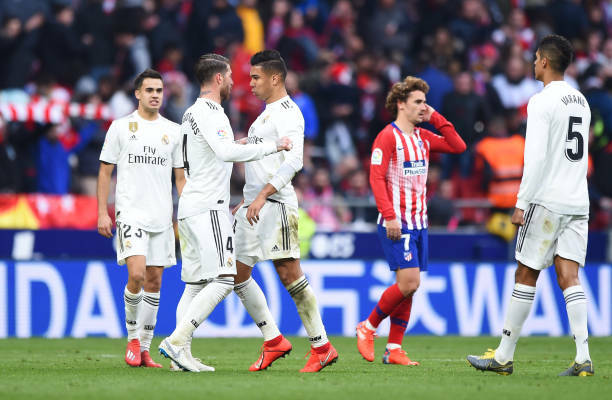 Real Madrid fought their way back into the Spanish La Liga title race with a 3-1 victory over Atletico Madrid in a derby win at the Wanda Metropolitano on Saturday. Casemiro, Sergio Ramos and Gareth Bale’s strikes inflicted Atletico’s first home defeat of the season across all competitions and moved the European champions up to second, within five points of leaders Barcelona, as their revival under Santiago Solari continued. Antoine Griezmann equalised for Atletico after Casemiro’s overhead kick sent Real ahead, but Ramos slammed home from the penalty spot before halftime to silence the home fans. Atletico’s Alvaro Morata netted a brilliant lob against his former side but it was ruled out for offside before Bale drilled in the visitors’ third to secure the points for Real Madrid. Thomas Partey was dismissed after getting his second yellow card at the end of a disappointing afternoon for Diego Simeone’s side, who dropped to third after losing for the second weekend in a row.